Athletes obviously enjoy breaking a sweat, but it’s not often that you’ll see one break into a smile while in the throes of competition. Yet that’s exactly what many coaches instruct them to do: Grinning mid-race has been said to relax muscles and boost physical performance. Recently, a group of researchers put this theory to the test, according to The New York Times. Their findings were published in the journal Psychology of Sport and Exercise. Researchers from Ulster University in Northern Ireland and Swansea University in Wales instructed a group of 24 non-professional runners—both men and women—to shift between smiles and scowls while running on a treadmill. The volunteers were told that the experiment would measure how certain factors affected the amount of oxygen they used while jogging at various running speeds. For the experiment’s first stage, runners wore face masks that measured their breathing. As they exercised until fatigue, researchers asked them to rate how they felt and report their coping strategies—for example, whether were they ignoring their pain or embracing it. The study’s second segment required volunteers to engage in four individual runs, each lasting for six minutes. Mid-run, they were told to smile both genuinely and continuously, to scowl, to relax their torsos using a visualization technique, or to simply fall back on their usual endurance mindsets. Smiles didn’t always improve runners’ performances. A few subjects picked up the pace while grimacing, possibly because these “game faces” made them ultra-determined to beat their personal records. But overall, runners with smiles were nearly 3 percent more efficient than normal. While seemingly insignificant, this difference is large enough to affect someone’s race performance, experts say. 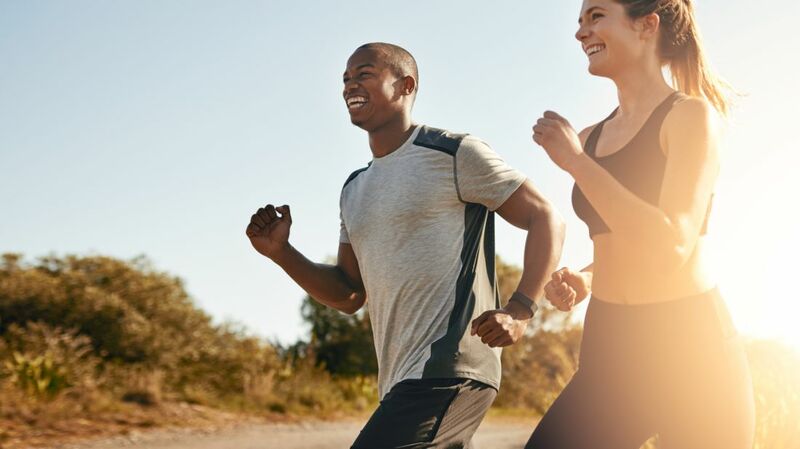 Keeping in mind the study’s small size, the authors conclude that exercising while smiling might reduce muscular tension and thus amp up performance. But in order to gain this positive effect, athletes must beam genuinely. Fake smiles, like the kind you’ll see in school pictures, don’t work as many facial muscles, and therefore result in lower levels of relaxation. Since it’s hard for anyone (let alone a focused athlete) to maintain an authentic smile during prolonged periods of strenuous activity, scientists suggest smiling near a race’s end, in 30-second intervals.